We can professionally move your pool table from room to room, city to city or state to state. Our pool table installation service is for all brands of pool tables. A.E Schmidt, American Classic, American Heirloom, American Heritage, AMF, Atlantic, Beach, Beringer, Black Bear, Brunswick, Craftmaster, Connelly, Fischer, Gandy, Golden West, Imperial, Kasson, Legacy, Leisure Bay, Olhausen, Peter Vitalie, Players Choice, Presidential, Proline, Renaissance, Spencer Marston, Saunier Wilhem, and World of Leisure, just to name a few. Thorough 10 point inspection of your pool table, slate and cloth. Complete and correct installation of your pool table in the new location. Final clean-up and orientation of your pool table care and maintenance. How long does it take for us to install your pool table? On average it takes 2 hours to inspect and install your pool table. How do I know if I have a 3 Piece slate pool table? Should I replace the bumpers on our pool table? If the bumpers on your pool table are hard we can re-rubber the bumpers on your pool table and make them play like new again. Do we need to re-felt our pool table? Re-felting your pool table with new cloth does not have to be done every time your pool table is reinstalled if it is stapled. 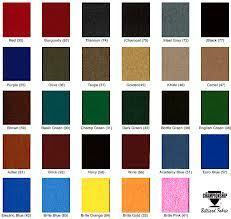 Felt can be unstapled and reused up to 3 times provided the felt is not in excess of 10 years old. There are somethings that you may want to consider ahead of time to make the installation go smoother. Before we install your pool table, you want to consider the color, condition and age of your felt. More often than not, the color scheme in the new room differs from the previous home. If the felt on the pool table is older than 7 years, now is a good time to have it re-felted. As felt ages, it gets weak and may tear when we try to re-stretch it. If we plan for re-felting while installing the table, we offer discounts on our re-felt service. 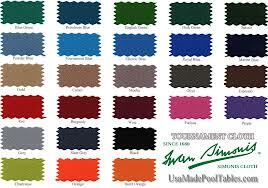 See our pool table re-felting color chart for color ideas. What size room do I need for a pool table if I am using a standard 57" pool cue? You might have to use a 36", 42", 48" or 52" short cue if your room size is smaller. 8' (44" x 88" play surface) 13' 2" x 16' 10"
9' (50" x 100" play surface) 13' 8" x 17' 10"
Where should we place our area rug? What is the proper height to hang our billiard light? Ideally you want a pool table light to be 36 inches (3ft) above the play surface. If your light is properly sized for the size of pool table you have, this should light the table evenly from end to end and side to side. To do this correctly without the pool table in place, the first thing we need to know is the height of the pool table. Most pool tables measure 30-32 inches from the floor to the top of the slate. Giving the proper measurement as 68 to 70 inches from the floor to the bottom of the light's shades. Use the room dimension chart below to help determine the location of your pool table. You want the light centered over your pool table. A pool table can be set up on any type of floor. Hardwood, tile, vinyl or carpet. If we are installing your pool table in a room without carpet, we use small round rubber shims underneath the legs. This will help to stabilize and level your pool table and keep us from using wooden shims that might otherwise show under the legs. Can our pool be installed if is located in a storage facility? We can pick up the pool table from the storage facility and install it in your home. 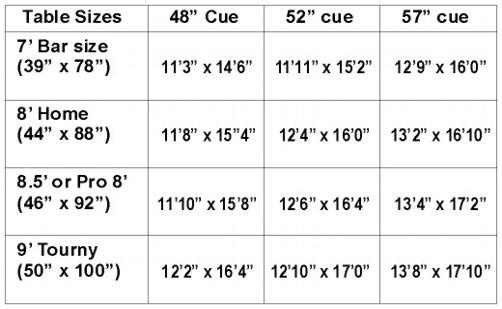 If you are interested in refelting your pool table with our installation service, please select a color from the chart below for refelting your pool table. *New felt is not included with our installation price. * Contact us to discuss our discounted pricing at 678-546-8618.